Bloomsburg University of Pennsylvania Solar Kiosk – AYA Instruments, Inc.
Accuenergy meters supplied by AYA that were used during the installation of the Kiosk. AYA Instruments Inc. played a role in the installation of a solar kiosk at Bloomsburg University of Pennsylvania. AYA supplied the university with instrumentation to build a structure that is designed to educate the Bloomsburg University community about solar energy and the university’s energy consumption. The kiosk is phase two of a four-phase energy project, which began with the installation of a 14-panel solar array. Using the Lucid Design Groups Building Dashboard software, students and faculty are able to look at energy use in five buildings across the campus. The structure is similar to a bus shelter on campus and has an interactive digital display, energy meters, and two-axis solar panels that track the sun in real time. These panels are programmed to automatically follow the movement of the sun and maximize the energy gathered. 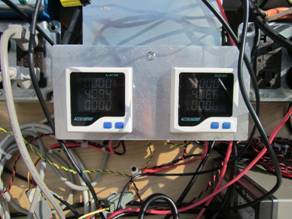 On the display at the kiosk, how much power, in watts, and energy, in watt-hours, each panel is producing is shown. This system will be utilized by students in energy-and-environment-related courses, and research student who will be able to access raw data for their own projects. The data and trends of this software will be used in the final phase of the four-phase project.